Wave Carver sired Gem Country winner Dewey Cox. EMMETT, ID�APRIL 27, 2013�Fastest qualifier Dewey Cox extended his win streak to four Saturday afternoon defeating Sixteen Kisses by three-quarters in the $7,352 Gem County Quarter Horse Derby at Emmett. Tony Hyde conditions the WAVE CARVER gelding for owner Delray Talbot. Under jockey Nikeela Black, the gray covered the 330 yard course in :16.999 seconds, a 96 speed index. The winner purse of $3,309 boosted his career total to just under $20,000. 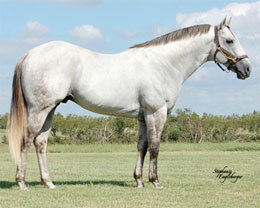 Jerry Windham bred Dewey Cox in Arizona from the Apollo (TB) mare Apollos Winner. Sixteen Kisses put in a good effort for owner Craig Giles Racing, LLC and trainer Nick Cronquist. Peterson Quarter Horses bred the filly in Utah. Elliot Bachicha, Jr. was up to earn $1,471. Texas-bred Zoomin For Class finished 1 � lengths back for owner Ross Brown and Elsha McGarry. Trained by Brown, the bay colt was ridden by Tyson Lusk. Alltheshine, Ms Eaves, La Pildorita and Jim Case completed the field. Jkh Hottflash was scratched.